Make this simple Chocolate Bark with Dried Fruit and Nuts as the perfect snack to satisfy your craving for something sweet and savory. You will love how easy this is to pull together and how fast you can have it ready to serve to friends and family. 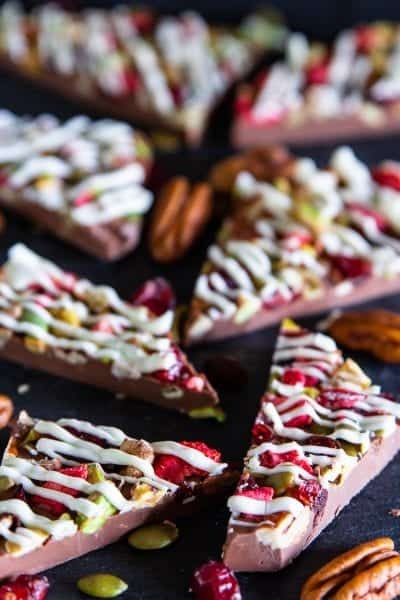 When making baskets of candy to gift to friends and family, pair this chocolate bark with some of our Chocolate Meringue Cookies. With Christmas coming up soon, many of us are planning on attending family gatherings and potlucks. 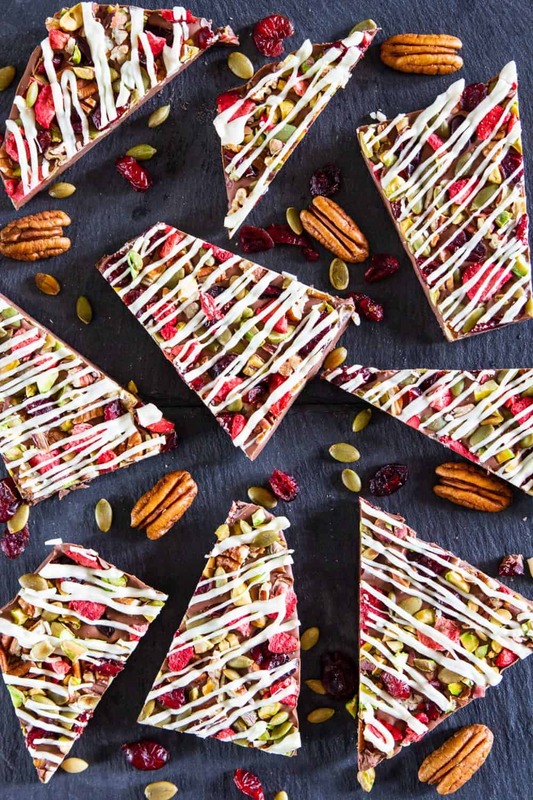 If you’re in charge of bringing some kind of dessert, make this fruit and nut chocolate bark. This bark is loaded with fine quality chocolate, pistachios, pumpkin seeds, pecans, dried cranberries, and freeze-dried strawberries. This melt in your mouth goodness is guaranteed to be a crowd pleaser, especially for chocolate lovers like myself. If you love no bake chocolate desserts, be sure to check out our no-bake chocolate caramel pretzel bars. Melt milk chocolate as directed in the printable recipe below. Scatter other ingredients over melted chocolate and then drizzle the top with melted white chocolate chips. Allow to harden before breaking into smaller pieces for easy snacking. You can easily make this and break into small pieces to bag and give as gifts any time of year. I love chocolate, so this recipe is definitely a favorite in my candy and dessert making repertoire. If you want something a bit richer and have time, make our Raspberry Chocolate Mousse Cake Recipe. For those wanting a fast and easy recipe that is a bit different than our homemade chocolate bark, you may be interested in trying the Chocolate Caramel Pretzels or easy Nutella Wonton Recipe. 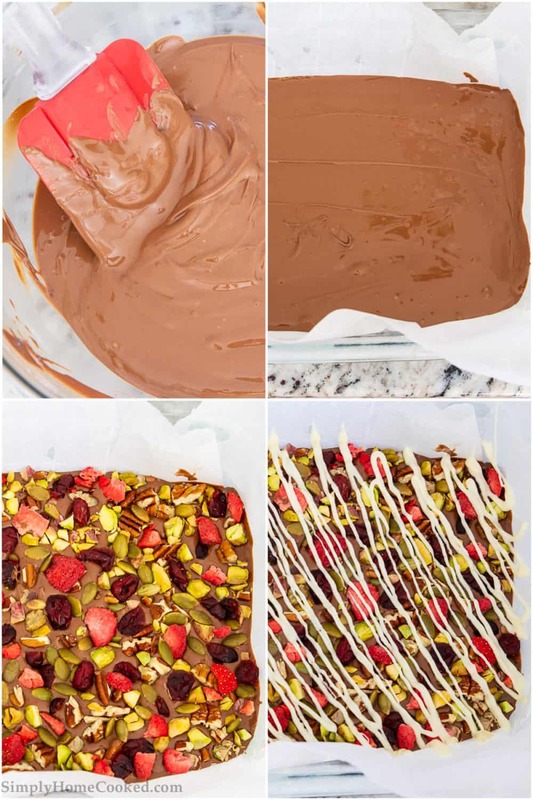 Make this simple Chocolate Bark with Dried Fruit and Nuts as the perfect snack to satisfy your craving for something sweet and savory. Melt the milk chocolate then pour it into a 9x13 inch pan lined with parchment paper. Chop the pecans, pistachios, and freeze dried strawberries. 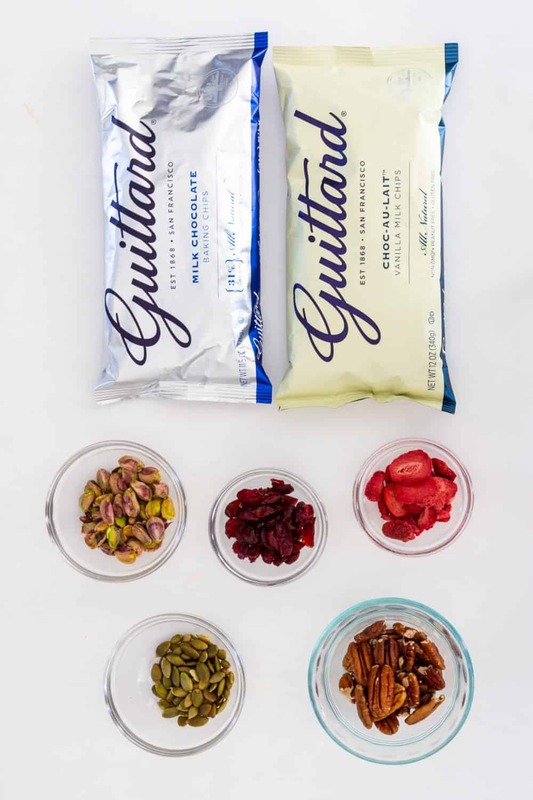 Spread the pistachios, pumpkin seeds, pecans, dried cranberries, and freeze dried strawberries over the milk chocolate. Melt the white chocolate and drizzle it over the fruits and nuts. Let it sit for 6 hours at room temperature until it stiffens completely.